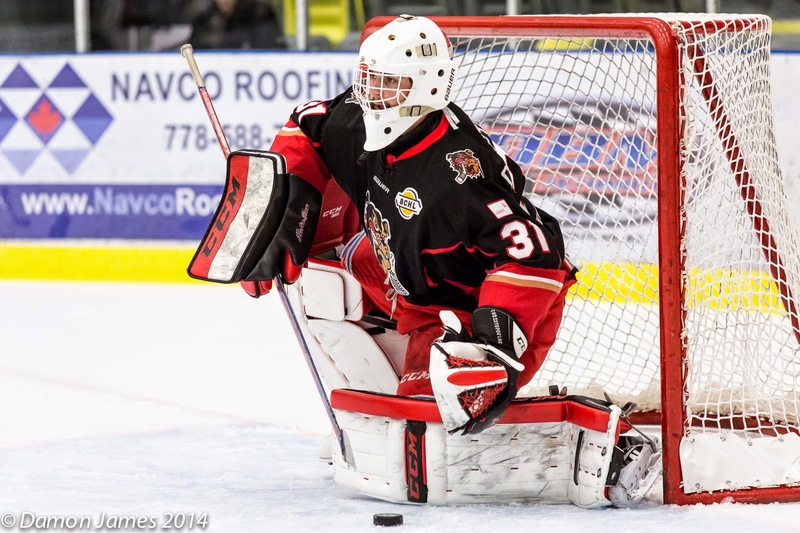 Big congrats to Kurt Gosselin for being named the BCHL's Player of the Week, and congrats to Billy Christopolous for getting a mention as well. The individual spin offs like this when the team achieves overall success sure are cool! CALGARY, Alberta (November 24, 2014) – An 11-game winning streak, one of the longest streaks in the country this season, has the Portage Terriers of the MJHL still on top of the Pointstreak CJHL Top 20 Weekly Rankings. The top four teams this week have held their spots in the rankings, while there are other surprises in the rankings this week. The Penticton Vees are padding their lead in the BCHL Interior Division, while the Alberni Valley Bulldogs and the Powell River Kings are making real strides in the Island Division behind the Nanaimo Clippers. In Alberta, the Camrose Kodiaks have overtaken the Spruce Grove Saints, but the Okotoks Oilers and Brooks Bandits are close behind. In Saskatchewan, the Melfort Mustangs had a tremendous week and have pulled within three points of the Kindersley Klippers, while the Flin Flon Bombers, Battlefords North Stars, Notre Dame Hounds and Nipawin Hawks have all gained ground on the Klippers. The Portage Terriers remain comfortably atop the overall MJHL standings, while the Winkler Flyers have opened up some room between themselves and the Winnipeg Blues. The Steinbach Pistons are playing well and are starting to move up the standings as well. In the SIJHL, the Fort Frances Lakers are tied atop their league standings with the Thunder Bay North Stars, but have two games in hand. In the NOJHL, the Soo Thunderbirds have snuck ahead of the Kirkland Lake Gold Miners in what is becoming a two horse race for Northern Ontario supremacy between them and Kirkland Lake. The Trenton Golden Hawks and the Aurora Tigers of the OJHL have just a single point between them for the overall lead in the standings, while the Georgetown Raiders are pushing hard to make it a three team race for the overall lead. In the CCHL the Ottawa Jr. ‘A’ Senators beat the first place Carleton Place Canadians in a great game on the weekend, but the Canadians are still running away with the overall lead in Central Canada. The Cougars de Sherbrooke were caught this past week by the Titan de Princeville and now share top spot in the standings of the LHJQ, while the Woodstock Slammers have a ten point lead on the second place Miramichi Timberwolves and are eleven points up on both the Dieppe Commandos and Pictou County Weeks Crushers. 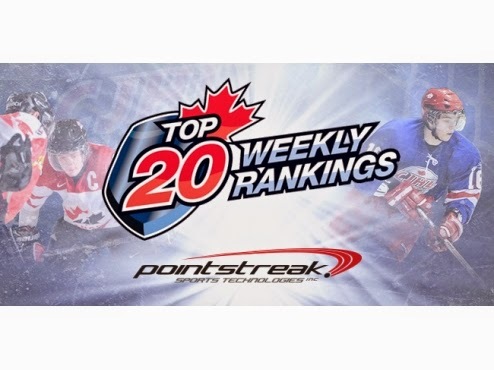 About the Pointstreak CJHL Top 20 Rankings - The CJHL Top 20 weekly rankings are produced in conjunction with International Scouting Services (ISS) and are based upon a variety of factors, including the league in which the team plays, winning percentage, win-loss record, total points accumulated, goals-for versus goals-against ratio, etc. About the CJHL - The Canadian Junior Hockey League is a national organization comprised of all 10 Junior A hockey leagues in Canada. The CJHL represents more than 129 teams and 2,900 players and has over 2,951 former players furthering their hockey careers at the professional, major junior and college level across North America. For latest CJHL news and features, visit www.cjhlhockey.com and follow us on Twitter at twitter.com/cjhlhockey or @cjhlhockey.